When Member States of the United Nations approved the 2030 Agenda for Sustainable Development in 2015, they agreed that the Sustainable Development Goals and Targets should be met for all nations and peoples and for all segments of society. Governments and stakeholders negotiating the 2030 Agenda backed the ambition of leaving no one behind, an ambition increasingly referred to in development policies, international agendas and civil society advocacy. How can we transform this ambition into reality? Policy makers, civil society and business are asking for more clarity on how to ensure that no one is left behind in practice. What does it mean for the design and delivery of economic, social and environmental policies? How should development co-operation policies, programming and accountability adapt? What should governments, development partners and the international community do differently to ensure that sustainable development goals benefit everyone and the furthest behind first? The 2018 Development Co-operation Report: Joining Forces to Leave No One Behind addresses all of these questions and many more. Informed by the latest evidence on what it means to be left behind, it adopts a wide range of perspectives and draws lessons from policies, practices and partnerships that work. The report proposes a holistic and innovative framework to shape and guide development co-operation policies and tools that are fit for the purpose of leaving no one behind.The full report will be published in November. Editorial: How far do we need to go to fulfil the promise of the 2030 Agenda for Sustainable Development to “Leave No One Behind”? How development co-operation can play to its strengths to achieve the SDGs for all. Are providers equipped to deliver on this central promise of Agenda 2030? This report frames the challenge from the points of view of the various actors, documents dozens of good practices, and highlights priority areas for reforming development co-operation. OECD Secretary-General, Angel Gurrìa, speaks about the Developement Co-operation Report 2018 and the importance of leaving no one behind. DATA: Long-term trends in aid received by developing countries 2000-2019: a dynamic and unpredictable picture. The OECD collaborated with Our World in Data to produce data visualisations of extreme poverty and other development indicators now and in 2030 and of the latest trends in ‘programmable aid’ received by developing countries. Our World in Data is a project of the Oxford Martin Programme on Global Development, University of Oxford. Explore the data! Does enough aid reach ‘countries most in need’? What do trends for nearly 20 years (2000-2019) of country programmable aid tell us? A closer look at trends in aid allocations globally in 2016 - measured as country programmable aid - suggest there is scope to re-think the criteria and models for allocating ODA to countries most in need. Where do development co-operation providers spend their aid and what do they spend it on? What are the main shifts and trends in development co-operation? 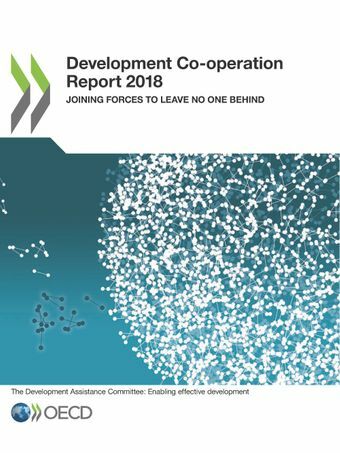 Development Co-operation Report (DCR) 2018 contains the individual profiles of all members of the Development Assistance Committee (DAC) as well 13 other providers that report to the OECD in a sufficiently granular manner, and private development finance from two foundations. It also includes estimates on development finance for 10 countries that do not currently report to the OECD. Leave No One Behind: How are Development Assistance Committee members answering the pledge of the 2030 Agenda for Sustainable Development? Can we leave no one behind in a world so unequal?